When you're supplying a product that can injure or kill, you need to emphasize safety, which is what Hawaiian Electric Co. does through employees such as Resti Paguirigan. Above, Paguirigan last week used a miniature high-voltage simulator to show what happens when a person touches a car that is in contact with live power lines. Job: Promotes employee and public safety for Hawaiian Electric Co.
Resti Paguirigan is a man who fights off danger. To everyone he meets, he is a changer. With every move he makes, he raises all our stakes, in helping us to live to see tomorrow. Secret agent man, secret ... uh, well, not exactly. His real title is public safety specialist, but you get the point (with apologies to the two guys who wrote "Secret Agent Man"). 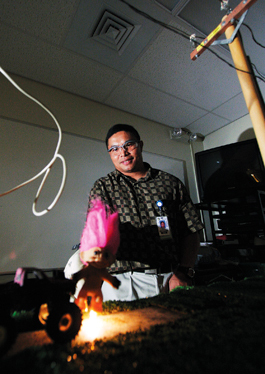 Paguirigan works at Hawaiian Electric Co. to assure safety among both the company's almost 1,500 employees and the general public. He brings a strong scientific background to the job, holding a bachelor's degree in electrical engineering from Long Beach State University, a master's of science degree in biochemistry and food science and public health from the University of Hawaii, and a master's in business administration, specializing in information systems, from Chaminade University. And besides that, he's smart. Also a graduate of Farrington High School, for which he coaches its junior varsity football team, Paguirigan is one of the voices behind HECO's radio commercials warning against allowing those metallic party balloons to fly free. He also conducts safety seminars, investigates accidents, researches ways to improve safety, helps track down copper and energy thieves and gives presentations at schools. Paguirigan, 37, is married to the former Michelle Choo, with whom he lives in Pacific Palisades. They have three dogs. 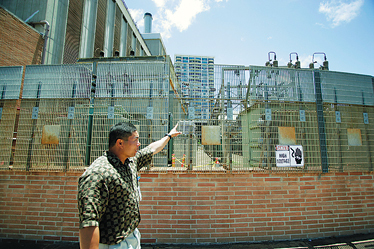 Paguirigan pointed out safety measures at the power plant near Honolulu Harbor. Mark Coleman: How long have you been a public safety specialist for Hawaiian Electric Co.? Resti Paguirigan: I'm closing in on five years. Q: Are you in charge of a division with a staff and a budget? A: I am part of a division. A: The safety division. We're like a division of 11 people and each of us have a specific area that we oversee. So one individual may oversee the construction side, and one person the power-supply side. Myself, I oversee the general public, the contractors, as well as some divisions within Hawaiian Electric. Q: Who is your direct supervisor or boss? A: My boss is the safety director; his name is Alden Ishii. Q: Why did you leave Frito-Lay of Hawaii, where you were its quality-assurance engineer, lab chemist and safety manager? A: Well, the opportunity was available to me here, and when I looked at the qualifications of the individual they needed, I fit the criteria. They needed an engineer with a background in safety. Q: What did you do to assure quality at Frito-Lay -- eat lots of potato chips? A: (Laughter) I had my share of that. But also integrating new technology into the manufacturing process. Q: At HECO, what kinds of safety issues are you concerned about? A: There's tons of safety issues, but, of course, on the forefront now, with all these copper thefts going on, that's been a big concern. Q: How is that a safety issue? A: That's a safety issue because, for one, the person stealing it usually doesn't know much about electricity, and No. 2, when we have our employees who need to work on it, a lot of times they might not know that their safety has been compromised, as well as the greater general public. 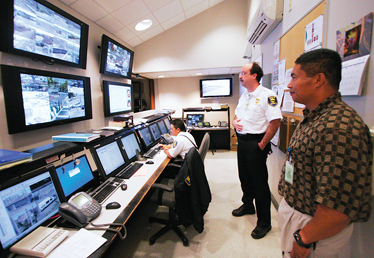 Resti Paguirigan has been a public safety specialist at Hawaiian Electric Co. for almost five years. Above, Paguirigan, right, last week visited Akal Security workers Sid Sanders, center, and Marli Aquino, seated, at HECO's security command center. Q: What is this copper that they're stealing anyway? A: We have several types of metals that we used to conduct electricity, and copper wire is one of the metals that we use. Q: Where do they get it from? A: They might get it from going into our facilities, such as our power stations; there's some copper on our poles; and some that's within our cabinets that are on the streets, those power transformers. Q: You also help the company find energy thieves? A: Usually what occurs is either a customer will call us or else one of our field employees will be reading a meter and see something unusual, like a nonstandard hookup or installation. So that's where I get called in, to see if it could be tampering or theft. A lot of times, too, customers themselves, their bill will be higher than usual with no higher usage, so they'll give us a call, and come to find out their neighbor is tapping their line. So a lot of times that's how we find out. But also, in the near future, we'll have meters than can read real-time power usage, so it can detect instances when somebody's tampering. Q: What would you say is the No. 1 safety issue concerning HECO employees? A: For our employees, right now, from a safety perspective, we perform very well. (But) some of our latest efforts for lessening injuries are using different protective gear in case there is electrical flash. A lot of our focus has been on preventing electrical flash injuries. Q: When are those most likely to occur? A: Those mostly likely occur when our employees -- especially our line workers, substation workers and electricians --- are working on live electrical components. 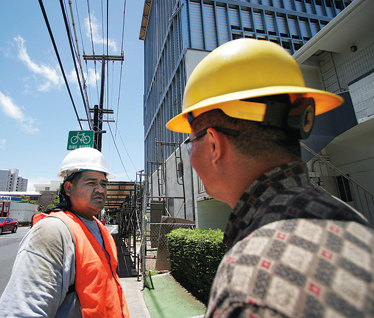 Paguirigan spoke with Ronley Lakalaka of TNT Construction at a site in Makiki where HECO installed insulative rubber on 12,000-volt lines near a building under construction as a safety precaution for the workers. Q: What is the main thing you try to caution the public about? A: In terms of public education, it's knowing that electricity does exist, either overhead or underground. So my greatest caution is to know that it's there and keep your boundaries away from high-voltage electricity. For overhead lines, the statutes say to stay 10 feet away from live electrical lines. Q: How come birds don't get zapped? A: (Laughter) That's a question I always get asked. The reason birds don't get zapped is that in order to feel the electrical surge, a sensation, electricity needs to flow from a high-voltage to a lower voltage source, or a ground. So if the bird just sits on the power line, he's on the high voltage source, but there's no low-voltage source (he's linked to), so that's why he doesn't get shocked. Q: Would that apply to a human? A: If the human were able to jump from the ground and grab the electrical line, that would be the case, but if he's holding on to the pole, that would be grounded and electricity would surge through the person's body. Q: How do you convey your safety information to HECO's employees? A: For HECO employees, we have monthly safety training, so that's where the message gets across. And for each month it's a different topic. Q: What was the topic this month? Q: How do you stay up on the latest information in your field? A: For us, we get retrained, we get re-certified. There's always publications that come out in terms of new technology or new philosophy on how to train and motivate our employees. So we go through that process, as well as go to seminars. Q: How important has your electrical engineering education been in helping you do your job? A: It's been quite significant, because any time that I perform my work, whether it deals with investigations or with educating, we need to get a fairly good science background as to how things work and how things can affect you. So the engineering degree has certainly helped from a technical perspective. Q: What about your degrees in biochemistry and food science -- are they helping you much anymore? A: (Laughter) I guess from a thinking perspective they do. I'm mean, they're sciences. Q: I heard that in your leisure time, you like to ride motor cycles and go hiking. Those sound kind of dangerous to me. A: (Laughter) I do take precautions. And I'm talking more about leisure riding -- those Harley-Davidson-type bikes. No motocross. Q: What's your least favorite part of your job? A: The least favorite part of my job, is, unfortunately, there are instances where people do get hurt or injured and sometimes even death, and I have to be there to investigate, to see what the issues are. So that's probably my least-liked portion. But it's also an essential portion, too, because I need to see what good science principles will help us prevent such things in the future -- and also for litigation purposes, since I have to testify sometimes in court. A: My favorite part of my job is that it's very dynamic, in terms of what is going to happen for the day. I do have quite an array of activity that I can look forward to. One day I might be out on the North Shore investigating an accident, while in the afternoon, I could be in a kindergarten classroom talking about electricity. A: I have normal work hours from 7 to 4, but I'm on call 24 hours a day, seven days a week.